Is this Mr. Mom? Male and female spotted sandpipers look much alike, both with a spotted breast during the breeding season (and a clear breast for the rest of the year), but females are 25 percent bigger. Females stake out territories and court males, which then incubate the eggs and care for the chicks. A female may lay up to 4 clutches of eggs, each for a different male to tend. You never know what unusual surprises nature offers in your own back yard, or along the shores of our own ponds and rivers. It turns out that our local shores are breeding grounds for a bird that’s Mr. Mom. Those of us who fish or boat are most likely to have seen a spotted sandpiper (Actitis macularia). These shorebirds commonly breed along the undeveloped shores of inland streams and lakes. Westborough’s Mill Pond is one such place. Watch for them along the shore at the Headwaters Conservation Area, in areas such as the section of the Pumphouse Trail that leads from the Andrews Street entrance to the pump house on the peninsula. The first unusual thing about spotted sandpipers is the fact that the males are Mr. Mom. Spotted sandpipers reverse the roles that male and female birds usually play during the breeding season. We’re often charmed as we hear male birds singing to stake out territories or as we glimpse a female bird on the nest. But spotted sandpipers do things the other way around. When spotted sandpipers arrive in our area after wintering in the southern U.S or Central or South America, it’s the females – not the males – who arrive first. They get busy staking out prime territories along shorelines, competing to claim the best areas with good nesting sites and plenty of insects to eat. That’s usually a male bird’s role. The female spotted sandpipers are well equipped for aggression, such as chasing and even fighting rival females. They’re all 25 percent bigger than the males, which is the reverse of what’s usual with many birds. About 10 percent of the females get injuries (such as broken legs) in fights with other females. Then the males start to arrive. Typically the older, more experienced males arrive first. Unlike most birds, it’s the female spotted sandpipers that display and actively court the males – not the other way around. If you see a spotted sandpiper strutting along the shore or on top of a log, that’s probably a female showing off to a male. Once a male and female pair up, they stay close together for days. Often the female starts a nest but the male finishes it. The nest is simple – a shallow depression in the ground, which the bird makes by scraping the ground with its legs and body and then fills with dead grasses. Where might you find a spotted sandpiper’s nest? It’s typically located in a grassy or weedy area along a shoreline, in a place that’s shaded by vegetation throughout the day. This makes sense because spotted sandpiper eggs are vulnerable to heat but quite resistant to cold. The female, of course, lays the eggs, but Mr. Mom swings into action once the third egg – of four – is laid. At that point the male starts sitting on the nest to warm the eggs. And that’s what he keeps doing. He incubates the eggs for three weeks until they hatch. Within a day, the down-covered chicks are ready to leave the nest and start catching their own food, but the male stays near them and tends them for another 3-4 weeks until they can fly. What causes this role reversal? Not surprisingly, hormones are involved – especially the interaction of two hormones. 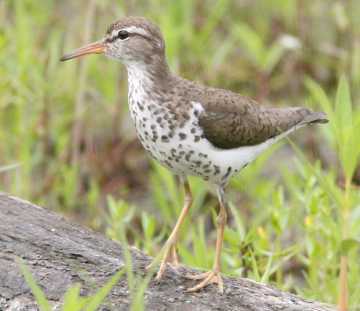 The first hormone is associated with parenting behavior and incubation, and it’s relatively high in spotted sandpiper males during the breeding season. (The human version of this hormone enables breast-feeding mothers to produce milk.) The second hormone is the male hormone that’s familiar to us as testosterone. What happens? When the third egg is laid, the male spotted sandpiper’s male hormone level drops, and this change allows the first hormone to prompt him to incubate the eggs. But what is the female doing all this time? If there are few other males around, she’s likely to help Mr. Mom with incubation and chick-tending chores. And she typically stands guard and gives alarm calls if a predator – or a human – approaches. In other cases, particularly when other males are around, she leaves her mate as soon as she finishes laying eggs. Right away she starts calling other males, displaying, and courting them. Then she pairs with a second male and lays a clutch of eggs for him to incubate. She may even move on to attract a third male. Late in the breeding season, she may help her last mate with incubating the final clutch and caring for the last chicks. This behavior is the second and most unusual thing about spotted sandpipers. They’re among the 1 percent of birds where the female commonly pairs with more than one male. The female can have many “husbands” at once. Female spotted sandpipers sometimes lay eggs for four different males in a single breeding season. What’s the advantage for the female in this arrangement? She gets to produce many more chicks than she could do with just one mate. After all, she may have four Mr. Moms raising them. It’s less clear what advantage exists for the males. But if males outnumber females in an area, this arrangement allows more males to produce chicks. Otherwise they’d be unpaired for the breeding season. Spotted sandpipers may not be easy to observe, but if you happen to see one, look in the same location again next year. These birds tend to return to the same areas where they’ve nested successfully, and the more you watch, the more likely you are to see some of their unusual behavior. You can tell when you’re getting near a nest or group of chicks because an adult sandpiper is likely to put on an act to get your attention and lead you away. It will do a “broken wing” act, peeping loudly and fluttering along the ground, dragging its wings or tail as if injured. Whether you see a spotted sandpiper or not, it’s fun to know that a bird with such unusual ways comes to our very own Mill Pond.